GERALD A. SHARP began his studies at the age of 12 in the martial arts with Shorin Ryu and Shotokan Karate. At age 14 he had his first experience with Chinese Kung Fu studying Shaolin Five Animals. Not realizing the long range benefits of Martial Arts practice, he stopped after some time. Shortly after coming to Los Angeles in 1981, he began training with many Masters in the Los Angeles area including: Master Xu (Veera Vassantachart), Li Mei Ling, Jiang Hao Quan, Dr. Carl Totton, and many others. 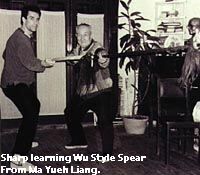 In 1990, Sharp would go on to travel to China several times over a ten-year period, studying the Wu style T'ai Chi Ch'uan (Original Wu Style Form also known as Fast Form) with Master Ma Yueh Liang, son-in-law of Wu Chian Chuan. 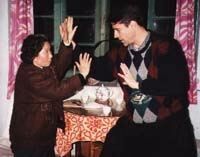 During this time, Sharp would study the Chen style of T'ai Chi Ch'uan with Master Zhou Yuan Long (Who drew the famous drawings of Chen Zhao Kwei, Chen Fake, Yang Cheng Fu, Jiang Rong Qiao, and many others), and Guo-Ling Chi Kung with Ju Beng Yi (Top Disciple of Guo-Ling). 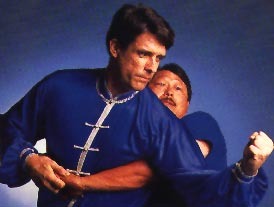 Since that time, Sharp has made several trips to China, and has studied Pa-Kua Chang, Hsing-I Chuan, and Nei Jia Kung Fu with Zou Shuxian (Top disciple and adopted daughter of Jiang Rong Qiao), a variety of internal weapons forms and two man forms with Cheng Jie Feng (a top internal forms competitor in China in the '80's, and an up and coming senior instructor of Sharp's generation.). Sharp also studied Hsing-I with Jiang Hao Chuan and Deng Fu Xing (Top disciple of Dong Zhi Ying). Aside from having great honor to train with Grandmaster Ma Yueh Liang, Sharp is one of the few Westerners to practice Push Hands publicly with Ma Yueh Liang. Teacher Gerald A. Sharp's accreditation and awards include: Wu style T'ai Chi Ch'uan system (Fast Form, Sword, Knife, Spear) from Ma Yueh Liang and the Wu Chian Chuan TaiChiChuan Association, which he is a member; Certificate of training in the Nei Jia system of Jiang Rong Qiao from Zou Shuxian; Certificate of training in Chen style T'ai Chi Ch'uan and Nei Jia Kung Fu with Cheng Jie Feng; Certificates of training in Chen style T'ai Chi Ch'uan (Series I, II, sword, and Push Hands) from Zhou Yuan Long; Certificate in the Guo Ling Chi Kung system from Ju Beng Yi; As well as, many first places in competition and exhibition both in the United States and China including: 1991 AAU Nationals (Council Bluffs, IA: First Place in Six Events: Pa-Kua Chang, T'ai Chi Ch'uan, Sword, Broadsword, Push Hands, Open Division; 1992 International Chinese Internal Martial Arts Championships, San Francisco, CA (Grand Champion and First Place in Chen and Wu forms, Second Place Push Hands); 1993 Tiger Balm International Chinese Martial Arts Championships, San Francisco, CA (First Place: Pa-Kua Chang form, Second Place: Internal Weapons); and 1994 World Grand Wushu Festival, Shanghai, P.R. 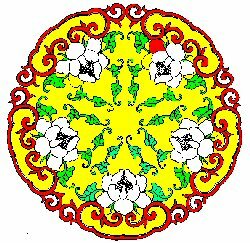 CHINA (4 Gold: Chen hand form, Chen sword form, Wu Fast Form, Wu spear form; 2 Silver: Hsing-I Hand Form, Hsing-I Weapon). Although the above list indicates influences from a number of teachers and styles, the internal martial arts instruction and demonstration featured at www.chiflow.com that is presented by Master Sharp in the classes and videos currently comes mainly from the teachings of Wu style TaiChiChuan Grandmaster Ma Yueh Liang and the Jiang Rong Qiao internal kung fu system as taught by Zou Shuxian and Cheng Jie Feng.